Lily Russell, undated photo. (This was taken around the time when she was Dean of the Union Building at Baylor University, 1948-1954.) 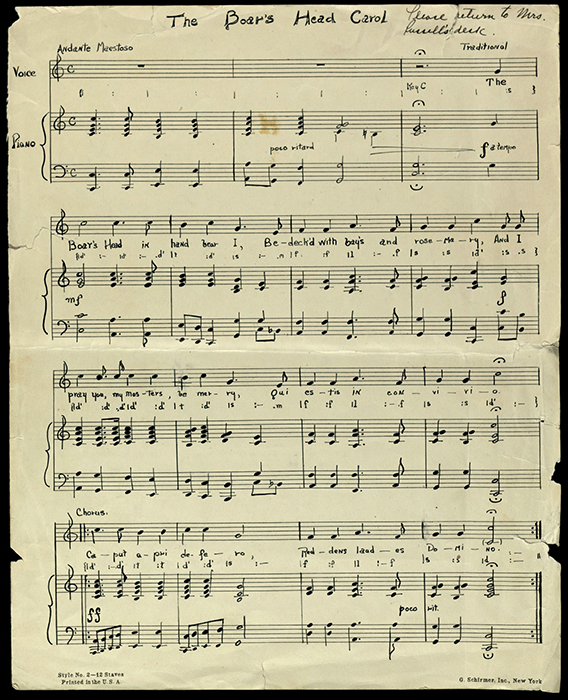 Lily McIlroy Russell papers. As last week’s Christmas on Fifth Street and the Christmas tree lighting celebration fade into memory, here at The Texas Collection it has revived nostalgia for Baylor’s Christmas celebrations of yesteryear. The first communal Christmas tree at Baylor originated with Irene Marschall, then current Dean of Women, in 1926. 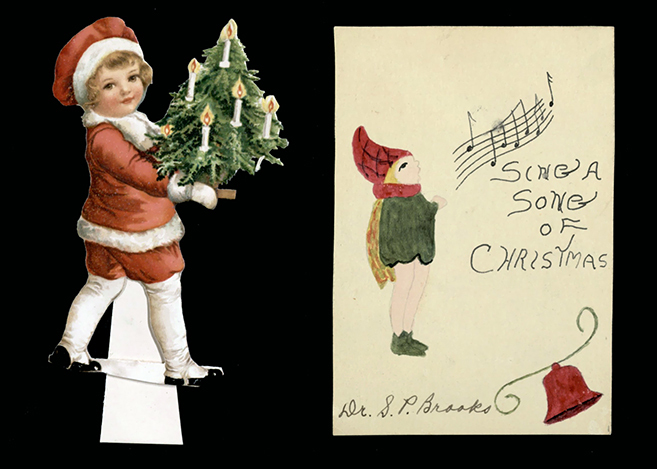 Aided by her assistant, Lily Russell, Marschall’s idea became an event on Fifth Street with the lighting of the tree, a performance by the Glee Club and an appearance by Santa Claus. 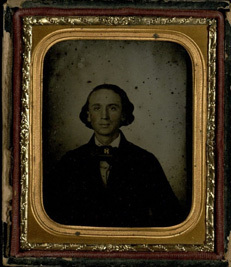 That same year, Russell wrote a Christmas program that would continue to be performed in the women’s dormitories at Baylor for over a decade. Known as “Old Christmas,” it was inspired by Washington Irving’s work of the same title. Performers included dormitory residents, members of student organizations and volunteers. Guests were immediately immersed in the setting after being greeted by cast members in costumes and viewing the decorations that adorned the entry and banquet hall. Guests were seated and carols were sung until the program, which incorporated a dinner within a dramatic production, began. The dinner included traditional English touches such as wassailing and the Boar’s Head feast. In 1935, Dr. A. J. Armstrong arranged for an antique wassail bowl to add to the authenticity of the event. The event was traditionally held in Burleson Hall, but as the program grew in popularity, a second night was added at Memorial Hall. 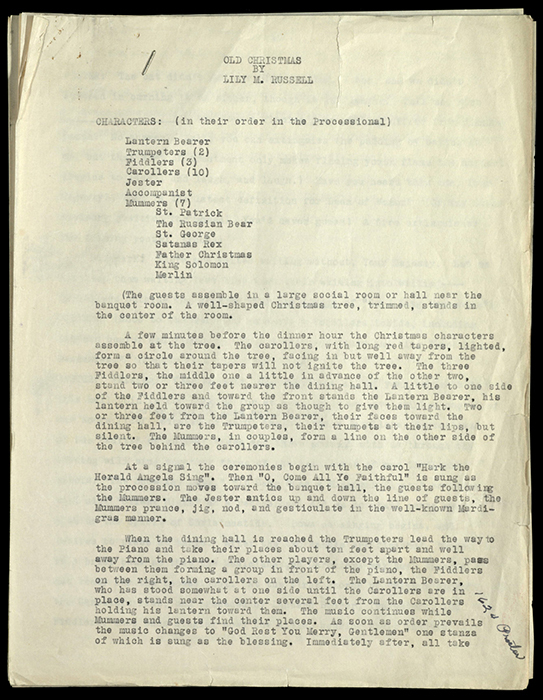 A revised script used in a production of “Old Christmas.” Although the core production remained identical, alterations were made through the years. 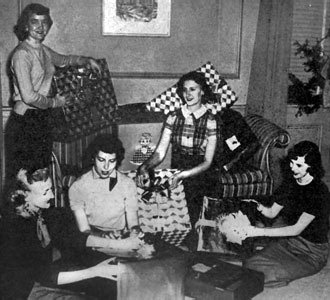 Lily Russell went on to become Dean of Women in 1931, and she organized not only the “Old Christmas” program but also other Baylor Christmas festivities. Christmas entertainment for students and faculty included dramatic productions, concerts, banquets and dances. 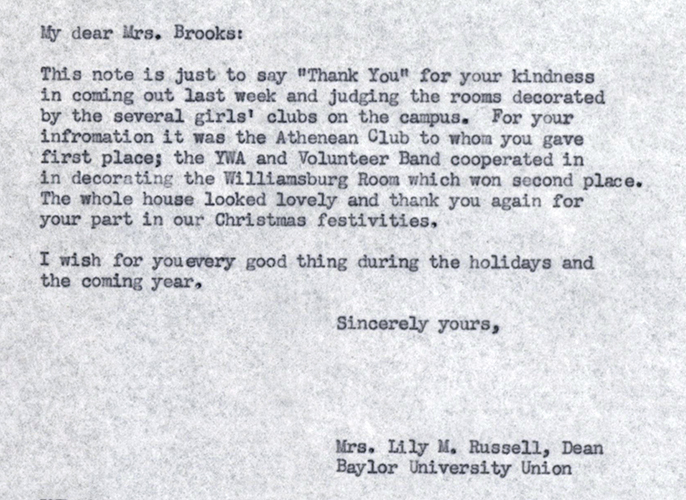 Excerpt from a 1953 letter written by Lily Russell to Mattie Brooks, thanking her for judging the decorating contest. After becoming Dean of the Union Building in 1948, Lily Russell found a way to share her passion for entertaining with student groups. She arranged for a competition in which student organizations would decorate the various rooms of the Union for the Christmas Open House event. Once completed, Russell arranged for people from the community to come in and pick their favorite rooms. After tallying the votes, the group with the winning room was presented a gold loving cup by the president of the university at the Open House. 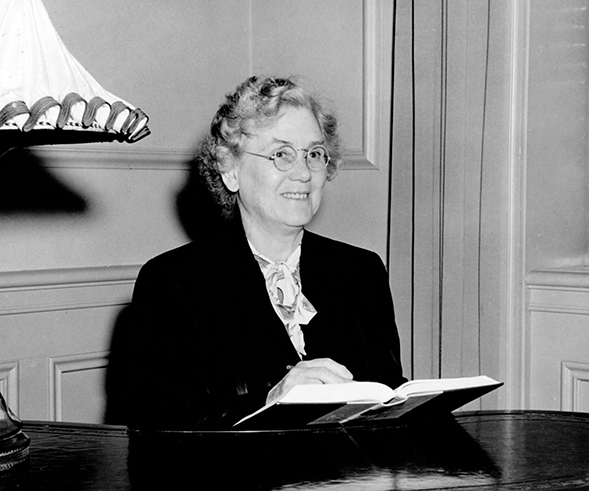 Lily Russell was highly involved in planning a range of events at Baylor, including the centennial celebration in 1945. 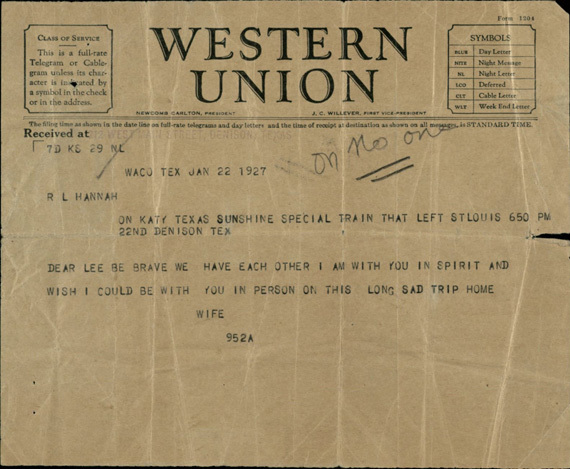 Visit The Texas Collection to view her collections (including BU Records: Dean of Women (Lily Russell) and BU Records: Dean of the Union Building (Lily Russell) and possibly be inspired by her style to add vintage flair to your next occasion. Lily Russell often saved clippings from newspapers and magazines for inspiration. 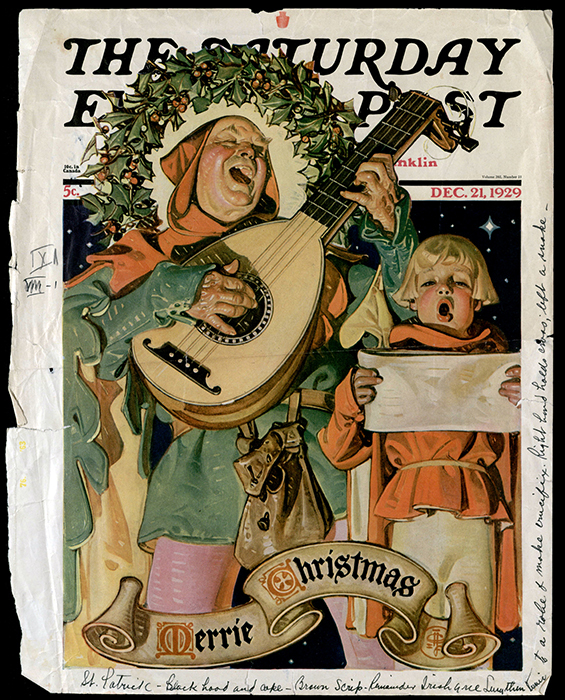 This 1929 issue of The Saturday Evening Post includes handwritten notes about costuming for the “Old Christmas” program. “Burleson and Memorial Girls Plan Two Evenings of Yule Festivities.” The Daily Lariat (Waco, TX), Dec. 17, 1935. Accessed 5 December 2013. “Burleson Formal Slated Tonight.” The Daily Lariat (Waco, TX), Dec. 21, 1939. Accessed 5 December 2013. “Burleson, Memorial Will Give Annual Christmas Parties.” The Daily Lariat (Waco, TX), Dec. 15, 1939. Accessed 5 December 2013. “Dean Marschall Plans Big Christmas Tree For Students.” The Daily Lariat (Waco, TX), Dec. 12, 1926. Accessed 5 December 2013. “Open House in Union Building Held Tomorrow.” The Baylor Lariat (Waco, TX), Dec. 11, 1953. Accessed 5 December 2013. Russell, Lily [vertical file]. The Texas Collection, Baylor University. Baylor's Finest Hour: Dr Pepper Hour! Over the long, hot summer, students (and staff!) on campus have been missing one of Baylor’s beloved traditions—Dr Pepper Hour. It goes on hiatus for the summer, but as classes start back up, the Baylor community happily gathers on Tuesday afternoons to enjoy tasty Dr Pepper floats. But how did the tradition get started? The Tuesday afternoon Coke Party is hailed as the most popular event sponsored by the Student Union. Students gathered for Coke, hot chocolate, games, and fellowship. 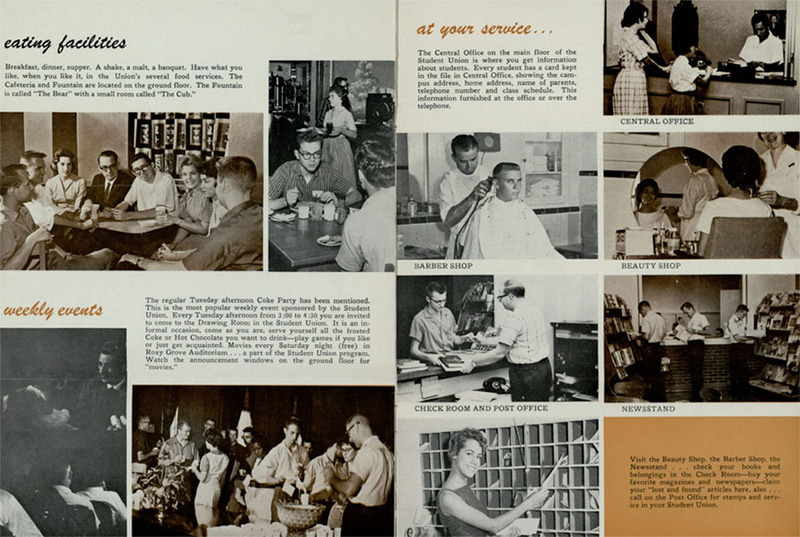 Other services offered by the Student Union Building included eating facilities, a barbershop, and a newsstand. The answer begins with the Student Union Building (SUB). Baylor University grew exponentially during the first half of the 20th century, and in response to the overwhelming desire to bring the expanding student body together, Baylor alumni advocated for the construction of a Student Union Building. The project began in 1940, but did not finish until after WWII due to lack of materials caused by the War. When it was first opened in 1947, the Union Building was home to a soda shop, barber shop, and seating area. As time went on, the SUB became home to a bowling alley, lending library, and even a shooting range. Traditions sprung up in efforts to bring the Baylor community together, and while many faded away with time, some, like Dr Pepper Hour, have survived. 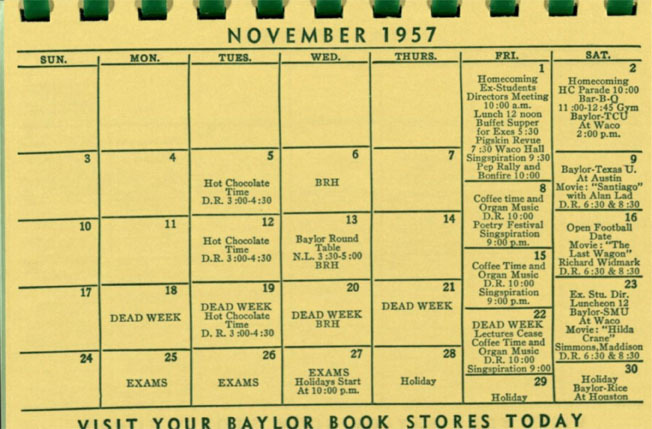 Note that instead of Coke or Dr Pepper Hour, the Student Union Building hosted Hot Chocolate Time on Tuesdays in November 1957–it must have been cold outside! What hasn’t changed is that every Tuesday at 3 pm, students, faculty, and staff get together, chat, and take a break from their hectic schedules, while enjoying a tasty beverage. 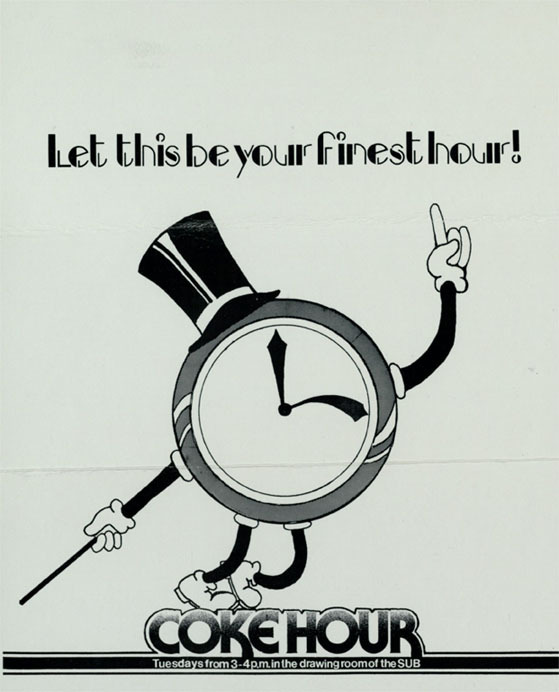 Coke Hour, along with the basement bowling alley and the second floor lending library, made the Student Union Building the center for student activities on campus. Dr Pepper floats aren’t the only treat you can make with Dr Pepper! 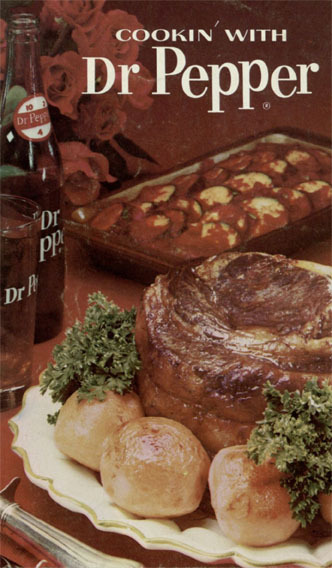 This cookbook at The Texas Collection will teach you how to cook everything from meatballs to butterscotch squares, using Dr Pepper as an ingredient. This cookbook is just one of nearly 5,000 Texas cookbooks in our print collection. In 1997, Baylor University entered an agreement with Dr Pepper Bottling Co., granting them campus exclusivity and sponsorship and promotional rights for athletic events as the University’s official soft drink. That agreement cemented Dr Pepper’s place as the beverage of choice, and the tradition has been Dr Pepper Hour ever since. So when 3 pm rolls around today, make sure you stop by Barfield Drawing Room (or the 6th floor of Robinson Tower, if you’re over there) for a refreshing Dr Pepper float, and enjoy spending time in community with the Baylor family. You’ll be in good company with the last six decades of Baylor alumni! Priscilla Escobedo is a senior international studies major from Irving, Texas. She has worked with the University Archives at The Texas Collection for nearly one year. She pulled the images for this post (except for the cookbook) from the Baylor printing office sorting project she has been working on for the past year.